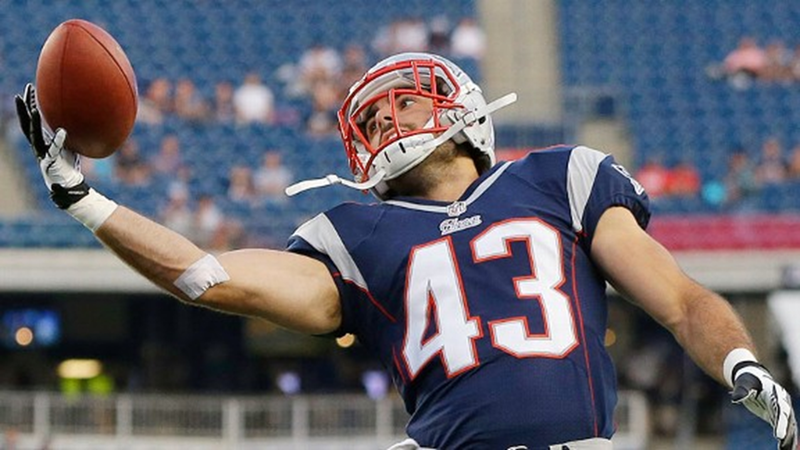 Nate Ebner had no doubts about his chances to make the Patriots' roster after being pick No. 197 in April's draft. Patriots rookie safety Nate Ebner didn't take the traditional route to the NFL. In fact, he never ran one route in high school football. The quiet, bearded guy with kind dark eyes and a body built to hit people is still learning the game, with three tackles in his first seven games. But if his past is any indication, it won't be long before he makes an impact. Ebner took his early love of rugby, a sport his father taught him growing up in Ohio, and translated it to a starring role on the United States U-19 and U-20 national teams. Then, without any high school football experience, he walked on at Ohio State and eventually earned a scholarship on special teams. And though no one was projecting an NFL future for Ebner, he dominated his pro day and got drafted in the sixth round. 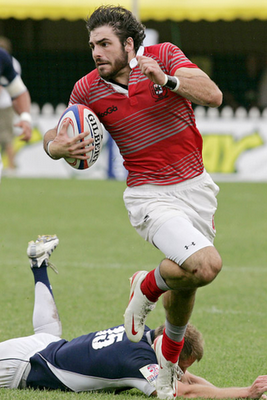 How does one go from MVP of the rugby World Cup to Ohio State football and an NFL roster spot? It started with a simple promise to get a degree. When Ebner got to Ohio State, his athletic prowess and academic responsibilities tugged him in different directions. Touring on the international rugby circuit wasn't conducive to classes and homework, and there was something about football -- particularly the promise of playing for the team he grew up watching -- that drove Ebner to try out. Ebner's first love was rugby, but the sport's skill set has served him well in his latest calling. "Walking on was a big step for me, not playing football in high school. I was sticking my neck out there …" said Ebner, who at 6-foot, 210 pounds had the size to play. Ebner talked to his father, Jeff, about his new goal. But tragedy would keep his dad from seeing his son's football dreams realized. In November 2008, Jeff was killed during a robbery at the family's auto-salvaging business. "It was real hard for me. I mean my dad and I were best friends," Ebner said. Ebner channeled his anger and reeling emotions into Buckeye football. "It was a distraction because I could put all my energy into it and focus on it," Ebner said, "as much as a distraction as you can have from something like that." Ebner's father, a former college rugby player, pushed his son to finish strong in whatever task he took on. When Ebner's aunt came across rubber bracelets bearing the "FINISH STRONG" message in bold white lettering, Ebner and his support system, including many of his Ohio State teammates, started wearing them as a powerful reminder. The words stretch across Ebner's wrist at every practice and game. It was his ability to finish strong that caught scouts eyes on Ohio State's pro day. Ebner logged a 4.55 40-yard dash, 4.04 shuttle and 6.59 three-cone drill. Though he had played just three defensive snaps for the Buckeyes in 2011, the Patriots' track record of turning under-the-radar athletes into NFL success stories wasn't lost on Ebner's backers. "Before I even knew anything about the Patriots I had people telling me I would be a good fit in a place like New England," Ebner said. "When I found out I was coming here … I can't put it into words, it was awesome. A dream come true." Ebner was taken with the 197th pick in the 2012 NFL draft, by no means a lock to make the Patriots' roster -- to the outside observer. Ebner, on the other hand, expected nothing less. "Obviously it was my goal to make the team. Why else would I be here working as hard as I can?" Ebner said. "So when I found out [I made it] it wasn't really a big thing where I was excited and celebrating, it was just what I came here to do." Being a 23-year-old rookie has its perceived challenges -- new town, teammates, playbook. But the rugby-phenom-turned-NFL-special-teamer is taking a pragmatic approach to his first season. "I just think about what I want to do every day -- make an impact and be productive for the team and obviously earn the respect of the guys," Ebner said. The respect, it seems, has already been earned. "It's pretty impressive to make it here," captain and four-time Pro Bowl guard Logan Mankins said of Ebner. "He's been a good addition to the team. Hard worker. Does everything the coaches and other players ask of him." Even fellow rookies sense Ebner's natural leadership. "He learns quick so sometimes I might have a question and instead of asking a veteran I can ask Nate and depend on him," first-year safety Tavon Wilson said. Lately, the Patriots have had to depend on Ebner for more than just special teams play. Injuries in the Patriots secondary have led to increased defensive snaps for Ebner. And it hasn't been easy -- he had a good look at Russell Wilson's winning 46-yard touchdown in the Patriots' Week 6 loss to Seattle. But the rookie workaholic already has the perspective of a veteran. "That's part of the sport. They're good athletes on the other side of the ball -- they get paid, too," Ebner said of on-field gaffes. "So, you just kind of swallow it and have a short memory when it comes to that stuff." By developing rookies like Ebner and getting consistent play from their veterans, the 4-3 Patriots are hoping to do something Ebner's proven quite good at.